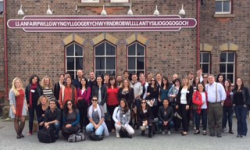 For a fifth year, Bangor University hosted forty bright young brain scientists from over 20 countries including Israel, Colombia, Ecuador, Lithuania and Sri Lanka at its annual international summer school. The Visceral Mind: A Hands on Course in the Anatomy of Human Cognition was held from 1-5 September. The course was made possible by a donation of of $225,000 from the James S McDonnell Foundation. The course was designed to provide an opportunity for young, bight cognitive neuroscientists from across the world to come to Bangor to increase their knowledge of neuroanatomy under a collection of world-renowned academics from Bangor and beyond. The students enjoyed an afternoon visiting the local areaNeurological patients who are active in research at the University participated in case conferences giving students the opportunity to learn how different areas of the brain function by observing techniques of neurological examination and interpreataion of brain scans. This approach brought neuroanatomy ‘to life’ and made it relevant to the students of cognitive neuroscience. “This key element of the programme would not have been possible without the help of NHS patients who regularly participate in our teaching and research programmes, and we are very grateful to all those who took part” commented the course director Prof. Bob Rafal. Noting that “there is no substitute for the life-changing experience of dissecting the human brain, and no better way to learn, by both sight and touch, the three-dimensional organ of mind”, Prof Rafal, was joined by Prof C. Harker Rhodes, Co-director of the course and neuropathologist from Dartmouth Medical School in the US, and Dr Toni Valero-Cabre from the Hosptial of the Saltpetrier in Paris as well as other Bangor neuroscientists in providing supervised practica in the anatomy laboratory. "The Visceral Mind course was one of the best experiences of my life."